With spring fashion appearing in all the stores, I’m getting the itch to bring some fresh color not only into my home, but closet too. I thought it would be fun to bring in a fashion expert today so I invited wardrobe stylist Jennifer of Style Your Life to share her thoughts on the colors and essential pieces for the season, please welcome Jennifer! “Hi there Centsational Girl readers, Jennifer here from Style Your Life. As a full time wardrobe stylist, this time of year is all about spring cleaning and refreshing our wardrobes. I did some online shopping with you in mind, and these are the eight pieces I think are must haves for your spring wardrobe! 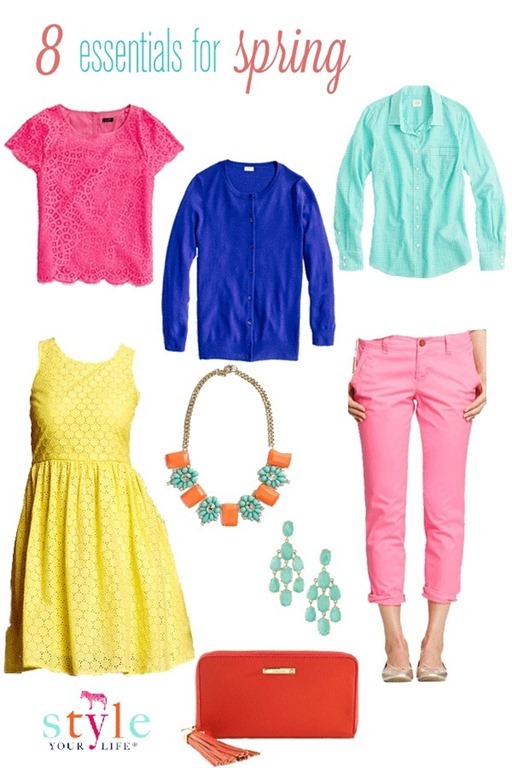 I don’t know about you but I am loving the colorful looks for spring. Bold color trends are still going strong into 2013. My favorite colors are turquoise, pink, and coral – they make my job easier since they are universally flattering, and everyone can wear these three colors. 1. A Casual Tee – I love that these stylish yet comfy tees are dressier then a plain old tee shirt! 2. A Spring Weight Cardigan – With the fluctuating temps of spring, layering is critical! This piece is a wardrobe staple. 3. A Button-Down Shirt – A great button down is incredibly versatile! 4. A Dress – Dresses are one of my favorite fashion weapons, they are a complete outfit and perfect for days when you don’t have a lot of time. These dresses can go from work to church to baby shower to summer wedding, they add instant chic to your day! 5. A Chino Pant – Gone are the days of “khaki pants” we now have a rainbow of colorful chino pants to select from. If you haven’t dared wear colored pants yet, it is time! I suggest starting with your favorite color, because chances are you’ll have a lot of items in your wardrobe that you will be able to wear with them. Now on to the accessories… or as I like to call them the sprinkles! If you are afraid to commit to bold colors with larger pieces, this is a perfect way to introduce bold spring color into your wardrobe. 6. A Statement Necklace – A wow necklace can truly “make” the outfit. Throw on a basic tee and jeans and add a statement necklace, it is seriously that easy! 7. A Statement Earring – If you are wearing a busy or patterned top or dress this is where you’ll add your fab factor. 8. A Bright Handbag or Clutch. Thank you Jennifer for sharing your tips with us today, I feel so stylish knowing I have picked out that same coral sweater at Banana Republic last week ! If you seek more wardrobe advice be sure to contact Jennifer at her blog, she’s a pro at pulling together pieces to fit your style. This makes me want to go shopping today! I love Jennifer’s !blog, and was excited to see her here today! I love all of the cheerful colors! Love the spring accessories! The pops of color are so refreshing. Thanks for having me Kate!! mmmmm! me encantan estos colores!! qué ganas de que llegue la primareva!! oooh.. i love all of the accessories! especially that j crew factory necklace! very pretty! Hi Jennifer! Would you relink the Floral Bouquet Necklace, it doesn’t seem to be working and it’s so very pretty! Can’t wait to check it out. Thanks much! I fixed the link Morgan! I’m ready to add a few more colorful items to my spring wardrobe! Love the yellow tee. That would be fun with the turquoise necklace. Love all of these, and own quite a few spring pieces myself, probably because I cannot wait for spring to arrive. Great post! Definitely makes me want to go shopping as well. I love, love, love the dress, half pink, half striped… Can you please tell me where to get it? Thank you!! !